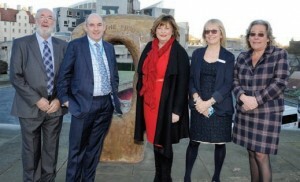 Pictured are chairman of BH&HPA (Scotland) Colin Fraser; national BH&HPA chairman Henry Wild; Scottish tourism minister Fiona Hyslop MSP; BH&HPA (Scotland) policy director Jeanette Wilson, and director general of BH&HPA Ros Pritchard. Owners and managers of many of Scotland’s 200 plus park businesses attended the annual conference of the BH&HPA (Scotland) in November, at the end of what was generally regarded as a highly successful year for their sector. Scottish tourism minister Fiona Hyslop MSP was the guest speaker at the event and was welcomed by Aberdeen park owner Colin Fraser who is chairman of BH&HPA (Scotland). Mr Fraser told the minister that an independent economic survey published last year found that Scottish holiday parks generate around £700m of visitor spending each year in Scotland. This figure, he said, accounts for 8% of all the revenue produced by Scotland’s tourism economy, and allows the Scottish park sector to support more than 5,600 full-time equivalent jobs. In her address to delegates, Fiona Hyslop said: “The holiday homes sector is a unique but vital part of our tourism and hospitality industry. The sector provides important geographic spread, allowing visitors to see more of our country and, in doing so, to support our rural economies.” Other speakers at the Edinburgh event included Director General of BH&HPA, Ros Pritchard, who outlined some of ways in which the association engages with politicians to help frame UK and EU laws and regulations affecting park businesses. National BH&HPA chairman Henry Wild also gave his perspective as a holiday park owner on how the association helps its members develop their businesses and meet customer expectations.